Clementine Music Player version 0.7.1 was released few days back and the venerable Amarok 1.4 fork continues its steady improvement it received during the last year. Clementine 0.7.1 is largely a bug fix release for Clementine 0.7 which came out with a number of major new features. Clementine PPA for Ubuntu Natty and Maverick is updated as well. What's New in Clementine 0.7? Brand new "Edit track information" dialog. You can now edit more fields, change multiple songs at once, change album cover art and view song statistics. Added an option to identify songs and fill in their tags automatically using information from MusicBrainz. Many other subtle UI improvements like the fade away animation of track name when you change the track for example. Also, when you install Clementine in Ubuntu 11.04, it is also available within Ubuntu Sound Menu by default. Nifty addition I would say. Another interesting feature is the background streams available. You can enjoy the sound of rain as background for your favorite songs. Loved it! How to Install Clementine 0.7.1 in Ubuntu 11.04 Natty, Ubuntu 10.10 Maverick? You need do the following in Terminal. Done. Brand new Clementine 0.7.1 is installed in your Ubuntu. I have successfully installed Clementine 0.7.1 in my Ubuntu 11.04 Natty Narwhal Beta. 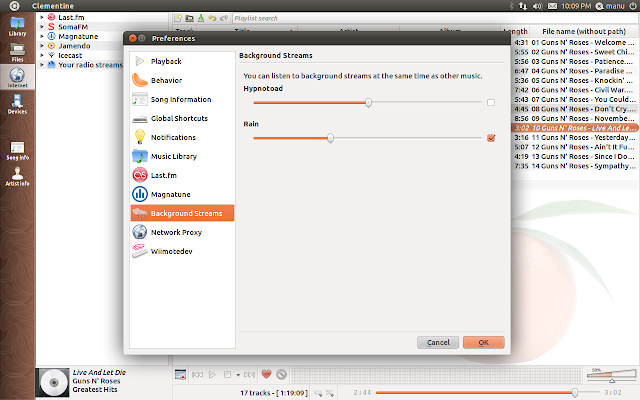 Clementine Music Player works on Windows, Mac and other versions of Linux as well. Visit Clementine Download Page for more information.